CBB: What is the state of the FY13 budget at this point? Where are the challenges and what have been the unexpected costs and savings? RC: The budget is balanced and it is a daily task to keep it that way. Facilities and Administrative (F&A) revenue from research is well below budget. Enrollment is down, but financial aid is down too—with the result that enrollment revenue is where it needs to be. Our biggest challenge is that we need $8 million in new revenue each year just to keep pace with rising costs. CBB: How will UVM pay for the changes that are part of President Sullivan's vision—e.g., declining undergraduate enrollment, capped tuition increases and additions to the faculty? RC: There must be a continued effort to create new revenue streams—through online programs, internationalization, etc. We can no longer rely on enrollment increases as a means for revenue. In terms of the lower enrollment targets that the President has communicated, it is likely that we are already there—or we are very close. CBB: You've told Staff Council in the past that the University will be able to solve its budget challenges related to staffing through normal attrition, without resorting to layoffs. Do you still believe that? CBB: There has been conversation over at least the last couple of years about two things: 1) recognizing that the workload for many staff is at capacity and some work needs to go away, and 2) overseeing the movement of staff into new roles as University needs change. How is either of these goals likely to be met without a structure in place to bring it about? Do you envision creating such a structure? RC: We are always discussing "work" and "people," and the way that things are being done has to change. The President and Provost will be reviewing the structure and practice of the University (including whether our decentralization is a help or hindrance), but we cannot move forward without input from a great number of people. Expect to see a cross-campus evaluation/analysis early in 2013. CBB: Will it be possible to address the "longstanding structural and program issues" highlighted in the State of Vermont's "Strengthening the Partnership" report without significant additional revenue? RC: Some changes could be made without significant new revenue, but certainly not all. There will always be competing interests and I expect that the President's Action Plan will be a top priority as we move forward. CBB: During budget crises in the recent past, there was increased conversation about fiscal issues. The Staff Council has been consistent about asking for information—not only during fiscal challenges, but all the time. 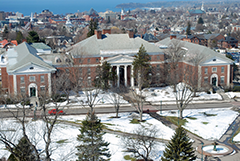 What is being done and what more can be done to make pertinent financial and budgetary news available to the UVM community? RC: We do try to take a balanced approach to sharing information. We don't want to cause undue concern about each challenge—recognizing that many problems that arise are solved before we would even be able to get word out to the whole UVM community. That's the nature of our work, but we are always open to suggestions aimed at improving communication. I would welcome your ideas to address the communication process. CBB: Who is involved in the Administration's regular weekly budget meetings? How does the group function and what is its focus? RC: The Financial Analysis and Budgeting Office, the Provost, Gary Derr and I meet on a weekly basis and focus most of our discussion on budgeting for the future. Alberto Citarella [University Budget Director] and I have ongoing meetings where we discuss proposals to fix issues with the current budget in order to minimize impact to the campus. CBB: What lesson do you think the Administration learned as a result of the recent union organizing effort? What work is being done to address the problems of communication and employee engagement? RC: I don't believe that it is unusual to have a continued advocacy for unions and I don't believe that such advocacy means that something is necessarily wrong. There is a continuing challenge with communication given the variety of staff at the University—and communication does need to be consistent and adequate, regardless of the existence of unions. CBB: In light of the shortfalls being experienced by the State of Vermont, is there reason to expect a rescission of revenue that we had been anticipating? RC: We have no reason to believe that there will be a cut in revenue from the state—but we don't expect it to grow much either. We recognize the financial challenges the state is experiencing. CBB: What will be the biggest budgetary challenges for FY14? RC: Growing revenue without growing enrollment. Everything we've talked about so far is an ongoing challenge, but especially the eight million additional dollars that we need each year in order for our budget to remain balanced. CBB: What is the outlook for unrepresented staff salary increases for FY14? RC: A year ago we indicated that our plan was to offer a 2.9% increase to non-represented staff for FY14, and that is still our focus. Postscript: Richard indicates that there has been ongoing work on the budget over the past month and that the FY 14 budget will be even more constrained than anticipated when he met with us. He has asked for a follow-up meeting with Staff Council’s Compensation, Benefits and Budget Committee to discuss this matter in more detail. More information will be available at the February 8 Board of Trustees meeting.